PKP Cargo, the Polish logistics operator and rail freight carrier, has placed an order with Siemens for the delivery of 15 Vectron type multisystem locomotives. Besides the provision of spare parts and maintenance for a period of eight years, the order includes an option for five more Vectrons. Twelve of these multisystem Vectrons are to be equipped to operate on the transit corridor running through Austria, the Czech Republic, Germany, Hungary, Poland and Slovakia. The remaining three units are earmarked for service on the transit route through Austria, the Czech Republic, Germany, Hungary, the Netherlands, Poland and Slovakia. All the locomotives will be equipped with the European Train Control System (ETCS). Delivery is scheduled to start at the beginning of 2016 and end in summer 2017. The locomotives will be built at the Siemens plant in Munich-Allach. A picture from this afternoon: PKP Cargo ES 64 F4-153 hauls EU46-507, 509 and 510. The three Vectron locomotives come back from Hungary, where they did approval runs in order to get homologated for revenue service in that country. We thank Vladislav Bokora for the image from Železná Studienka ('Eisenbrunnen Bratislava'). Seen today, between Bratislava Hlavná Stanica and Bratislava Lamač. PKP Cargo Vectron now also run in Slovakia. Thank you Peter Melicher. Last week, PKP Cargo sent it next three EU46 locomotives to Hungary for the neccessary approval tests. Various images of EU46-504/505/506 made by Norbert Tilai. 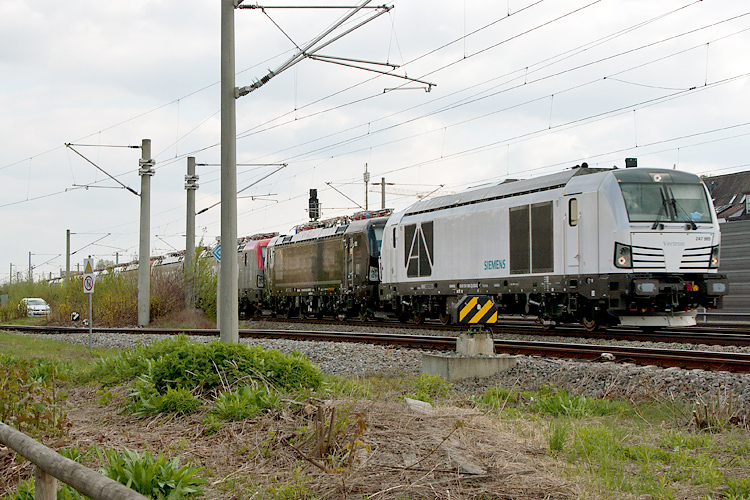 The first three PKP Cargo EU46-500 series locomotives have arrived in Hungary for the mandatory approval tests. Norbert Tilai was able to portrait EU46-501/-502/-503 today in Hegyeshalom. Images of the first run of a PKP Cargo Vectron in revenue service in Germany. A steel train to Germany. Images by Frank Gollhardt. Fabias Gross also filmed PKP Cargo Vectron no. EU46-502 tonight with a freight train bound for Bremen. The footage was recorded in Nienburg (Weser). Today, Siemens is sending the next three Vectron locomotives for PKP Cargo on their way to Poland. EU46-504, -505 and -506 were photographed by Sebastian Winter in Eisenach (DE). In July the next three locomotives will be outshopped by Siemens. Locomotive 10-12 will arrive in August. For the final three machines, that will have an additional package for the Netherlands, no delivery date has been mentioned so far. Rynek-kolejowy.pl brings many images of the first two days of the locomotives in Poland. Rynek kolejowy brings news and images about the PKP Cargo Vectron locomotives. The pictures show locomotives under construction and the EU46-503 in its final livery. In January 2016 the first three locomotives will be transported to Poland, as they have passed all static and dynamic tests successfully. Only the EU46-503 had front numbers. The 501 still had a white front hatch, the one of 502 was grey. Six units for PKP Cargo are known to us now. All with DE/AT/HU/PL/CZ/SK/RO package. Their Polish NVR numbers are 91 51 5370 013-018. Meanwhile is clear that the locomotives will get a red and light grey or silver livery. So we have to say goodbye to the blue and lime. Siemens 193 820, with additional stickers, served as presentation location today. Railcolor impression of the Vectron is red/white livery as presented today. Nothing official here. It is also not clear if this livery will be the final one. “This is our largest investment with regard to rolling stock for a long time. We have taken another solid step toward enhancing the international position of PKP Cargo and strengthening our presence in neighboring countries’ markets. Multisystem locomotives are the modern basis of rolling stock, which will make our international transport offering even more attractive and competitive for Polish and international customers,” says Adam Purwin, President of Management Board of PKP Cargo. “The tender was specifically prepared to enable participation of as many locomotive manufacturers as possible. We also aimed to achieve fast execution of the contract, as only the well-equipped multisystem loco fleet will help us to implement our international development strategy,” explains Wojciech Derda, Management Board Member of PKP Cargo for Operations. “With our Vectron locomotive, we were able to completely fulfill the corridor and performance requirements within the specified timeframe. Vectron is currently the only locomotive family in Europe that can do this,” said Jochen Eickholt, CEO of the Siemens Mobility Division. Railcolor.net: Some more details: Delivery start is scheduled for February 2016. The 15 machines of the initial order cost 75 million euro. They will be delivered in three batches. The option requires an additional 26 million euro.